ABER DAR, in the Cwmwd of Meisgyn, Cantref of Penythen (now called the Hundred of Miskin), Co. of GLAMORGAN, South Wales: a Curacy, not in charge, to the Vicarage of Llan Trisaint: Patron, The Vicar of Llan Trisaint: Church dedicated to St. John the Baptist. The Resident Population of this Parish, in 1801, was 1486. The Money raised by the Parish Rates, in 1803, was £436..12..7 1/2, at 13s. 11 1/4d. in the pound. It is 4 m. S.W. from Merthyr Tudfyl. The Fairs are holden on the 19th of April, Whitsun Monday, and 14th of November. This Parish contains about 2000 acres of cultivated land, and about 2000 acres which are uncultivated. Here are extensive Iron works, belonging to Messrs. Tappenton and Co., and Messrs. Scales and Co. According to the Diocesan Report, in 1809, the yearly value of this Benefice, arising from Stipend, and Augmentation, was £34..13. The Rev. EDWARD EVAN, an eminent dissenting preacher, philosopher, and poet, was a native of this place; and was one of the few who, according to Mr. Owen, being initiated into the Bardic mysteries, have helped to preserve the institution to the present time. He died on the 21st of June, 1798, being the day fixed for him to meet the other Bards of the Chair of Glamorgan. JEUAN DDU AB DAFYDD AB OWAIN, an eminent poet, was also a native of Aber Dar; and flourished from about the year 1440 to 1480. He was a gentleman of a large estate: and a great patron of the Bards, whose various acts of munificence are still traditionally told in the neighborhood where he resided. From: A Topographical Dictionary of The Dominion of Wales by Nicholas Carlisle, London, 1811. 1845-1947: minute books, agendas, registers, managers' reports, ledgers, invoice and wages books, correspondents. 1793-1961: minute, share transfer and account books, shareholders registers, deeds, plans, papers relating to liquidation. You can also perform a more selective search for churches in the Aberdare area or see them printed on a map. St Mairs Church, Seymour St, Aberdare - details on the RCT Heritage Trail site. "St Mair's Church was built for the Welsh speaking Anglican congregation of Aberdare Parish. The foundation stone was laid on July 2nd 1863...................." The Church was demolished in 1964, the site redeveloped and St Mair's Social Centre opened in 1969. A view of Aberdare church with a couple and their dog in the foreground. Mountains are in the background and two gravestones are on the periphery. The church is dedicated to St. John the Baptist, is in the Benefice of Aberdare, and Diocese of Llandaff. Details of the present incumbent of this benefice can be found at the Church in Wales website. The church can be found at grid reference SO000026. A transcription of the registers is available from the Glamorgan Family History Society for the years: Baptisms, 1734-1900, Marriages, 1717-1837, Burials, 1734-1924. Visit their website for information on how to purchase these fiche. Aberdare Ecclesiastical Parish records "Aberdare Ecclesiastical Parish records including registers for churches of St John and St Elvan of baptisms, 1734-1910; marriages, 1769-1937; burials, 1734-1946; records relating to: churchwardens, 1900-1939; property, 1869-1939; endowments and finance, 1894-1915; correspondence, 1881-1940; St Elvans church, 1862-1936; miscellaneous, 1854-1935; St Johns church, 1864-1938; St John the Evangelist, Robertstown, 1886-1912; St Mary Magdalene, Cwmbach, 1906-1914; St Marys Welsh Church, Maesydref, 1894-1936; St Matthews Mission Church, Abernant, 1885-1900; church affairs, 1901-1940; church organisations, 1892-1935; charities, 1884-1928; education, 1895-1920"
A set of fiche have been produced by the Glamorgan Family History Society covering registers of some Aberdare Chapels, for the period 1788-1951 (baptisms) and 1809-1836 (burials). "..... records including registers of baptisms, 1854-1975; marriages, 1854-1953; burials, 1855-1942"
The transcription of the section for Aberdare from The National Gazetteer (1868) provided by Colin Hinson. Ask for a calculation of the distance from Aberdare to another place. Williams Family of Pantygerddinen, Aberdare, papers "Records of the Williams family of Pantygerddinen, Aberdare, [c. 1826]-[c. 1920], consists of: Aberdare parish records, 1853-[c. 1865]; miscellaneous papers found loose in the volume, includes, papers concerning poetry [c. 1826]-1864, miscellanea, [c. 1860]-[c. 1920]; and deeds of property in Aberdare and Merthyr Tydfil, 1868-1911." You can see the administrative areas in which Aberdare has been placed at times in the past. Select one to see a link to a map of that particular area. Dyffryn Estate, Aberdare records 1615-1940 "In 1749 William Bruce (1705-68) of Llanblethian, Glamorgan, navy agent and banker, bought the Dyffryn estate in Aberdare from John Jones. His son, the Rev. Thomas Bruce (d 1790) of Llanblethian and Dyffryn, was succeeded by his sister Margaret (d 1809) the wife of John Knight (d 1799) of Llanblethian and Barnstaple in Devon. Their son John Knight (1784-1872) assumed the additional surname Bruce in 1805 on succeeding to his uncle's Aberdare estate, and the surname Pryce in 1837 on succeeding to his cousin Frances Ann Grey's Dyffryn estate in the parish of St Nicholas. ............................"
An article from the Aberdare Leader about the death of Alfred Jones from Aberdare during The First World War. The Population of Aberdare was as follows, and a more detailed breakdown is available. Aberdare Civil Parish records 1819-1904 "Records of Aberdare Civil Parish including tithe plan and apportionment, 1847; vestry minutes books, 1819-1904; assistant overseers' rate books, 1844-1849; church rate book, 1840-1842; surveyors' account (Cefnpennar), 1832-1844"
Aberdare Coroner's records "Post mortem reports and inquests, 1973-1983"
Aberdare Local Board of Health "Records of the Aberdare Local Board of Health, 1854-1901, consisting of: minutes, 1854-1894; committee minutes, 1866-1900 (including committee minutes for Aberdare Urban District Council, 1895-1900); ledgers, 1875-1878; letter books, 1866-1894; waterworks company balance sheets, 1858-1872; and the journal used by the Inspector of Canal Boats, 1890-1901"
Cynon Valley Borough Council records 1974-1996 "Cynon Valley Borough Council was formed in 1974 as a result of the Local Government Act 1972. 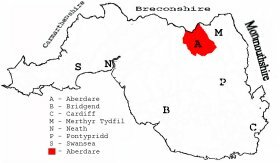 It comprised Aberdare and Mountain Ash Urban Districts and parts of Neath Rural District, in Glamorgan, and Penderyn in Vaynor and Penderyn Rural District, formerly in Breconshire. ................. In 1996, the council was replaced by Rhondda Cynon Taf County Borough Council as unitary authority." Miskin Higher Petty Sessional Division records 1853-1962 "Petty Sessions divisions were established based on the groups of parishes known as hundreds.................. In Glamorgan, the hundred of Miskin was covered by two divisions, Miskin Higher and Lower. Miskin Higher covered Aberdare, Abercynon, and Mountain Ash"
Wales Gas Board records Include ".......... Aberdare Gas Undertaking, 1845-1949.........."
Aberdare (and Mountain Ash) Division Primary/Elementary school records 19th century-20th century "Aberdare (and Mountain Ash) Division Primary/Elementary school records including log books and admission records relating to Aberaman schools, 1866-1939; Caradog Town school, 1921-1964; Aberdare Higher Standard school, 1890-1932; Aberdare Juvenile Unemployment Centre, 1927-1941; Open Air school for Physically and Mentally Disabled Children, 1914-1950; St. Fagans National school Trecynon, 1863-1963; Aberdare Town schools, 1875-1963; Duke street and Cwmdare Infants schools, 1869-1883; Abernant schools, 1892-1967; Aman schools, 1894-1960; Blaengwawr school, 1880-1969; Capcoch schools, 1872-1938; Cwmaman and Hirwaun War Nursery, 1943-1944; Cwmaman and Glynhafod schools, 1869-1987; Cwm-bach schools, 1868-1950; Cwmdare schools, 1864-1949; Hirwaun school, 1876-1949; Llwydcoed school, 1878-1934; Parc schools, 1865-1951; Pen-y-waun schools, 1897-1983; Robertstown school, 1972-1929; Ynyslwyd school, 1904-1953"
Aberdare School Board records "Aberdare School Board records comprising of minute books, 1872-1886; school returns, 1879-1923; report and letter books, 1878-1903; ledgers and accounts, 1872-1903; cash books, 1881-1901; ...................................."
Aberdare Mardy House (Church in Wales) Senior/Secondary Modern School records "......... comprising of logbooks, 1930-1969"
Pantglas Senior/Secondary school, Aberdare records "Pantglas school was a senior mixed school until 1952 when it became Pantglas Secondary school............." " .... records comprising of log book, 1940-1966"